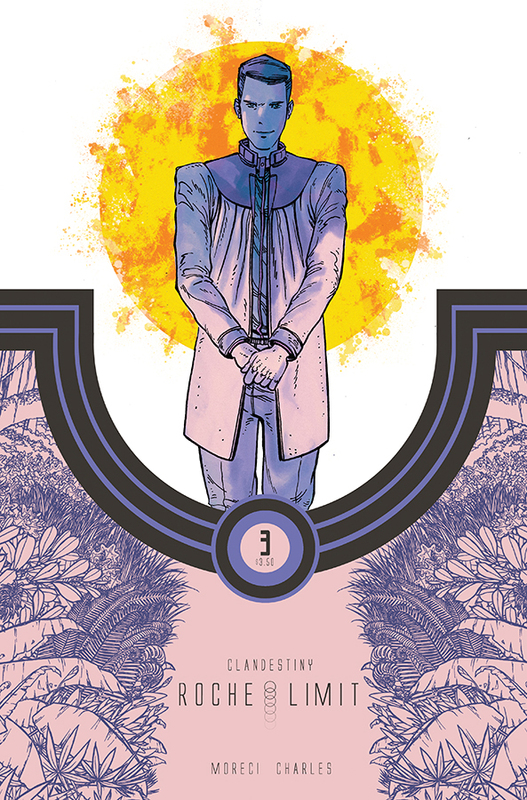 The third instalment of Michael Moreci’s Roche Limit: Clandestiny further establishes our main cast of characters, adding layer upon layer of realistic emotion as the true bleakness of their situation gradually unfolds. Once again, Moreci’s distinctive gift for blending nuanced philosophical concepts with gripping drama comes to the fore, providing yet another engaging and surprisingly accessible slice of highly intelligent sci-fi. This issue covers a lot of ground, from dealing with notions like faith and religion (something Moreci has previously dabbled in with his BOOM! Studios series Burning Fields) to asking bigger questions like “what is reality?” While other titles could potentially find themselves drowning in their attempt to tackle such grand concepts, Moreci keeps the ship sailing straight throughout, using these questions to enhance the ongoing story without ever allowing them to overshadow it. The artwork conveys the chaos that unfolds perfectly, particularly during the scenes set in the mysterious forest where the frantic linework of Kyle Charles is brought to life by the dense, claustrophobic colours of Matt Battaglia. There’s a scratchy, kinetic quality to Charles’ work that, to me, falls somewhere between Riley Rossmo and Rafael Albuquerque, painting a vivid picture without having to rely on an unnecessary level of detail. The interactions between Sasha and Hello Danny provide the main thrust of the narrative, and their conflicting ideologies and frequent clashing of heads give the book its unique spark, especially given the fact that we already know Danny is working towards his own mysterious agenda. There’s more of a sense of purpose to this issue, even with the increasingly existential ponderings, and the final pages take things in an unexpected new direction that is likely to make the remaining issues absolutely essential reading (assuming they weren’t already). For me, Roche Limit: Clandestiny is a fairly tough series to review, as it’s a book that really needs to be experienced first-hand in order for to get the full effect. In theory, some of the concepts may seem a little daunting, and those looking for a swashbuckling sci-fi romp are pretty much guaranteed to go home disappointed. However, readers who take the time to absorb the overall message and peel back the intriguing layers of mystery will find themselves faced with one of the most intelligent and gripping sci-fi comics on the shelves today, and – dare I say it – one of their new favourite titles.